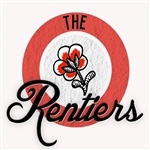 The Rentiers - Black Metal Yoga (Black with Blue Splatter) 7"
Indie? Pop? Punk? Folk? No! Yes! Indie? Pop? Punk? Folk? No! Yes! First pressing, 1 sided 12" limited to 300 copies. Features Joel (Plow United), Mikey Erg (Ergs), Anna (Chumped) and Tyler (Gym Class heroes).